Various aldoximes and ketoximes synthesis of corresponding aldehydes and ketones in the presence of SiO2@FeSO4 nano composite as recoverable nano catalyst and NH2OH·HCl. The SiO2@FeSO4 nano composite system was carried out between 10 to 15 min in oil bath (70-80 °C) under solvent-free condition in excellent yields in addition this protocol can be used for industrial scales. This method offers some advantages in term of clean reaction conditions, easy work-up procedure, short reaction time, applied to convert α-diketones to α-diketoximes (as longer than other carbonyl compounds), α,β-unsaturated aldehydes and ketones to corresponding oximes and suppression of any side product. So we think that NH2OH•HCl/SiO2@FeSO4 nano composite system could be considered a new and useful addition to the present methodologies in this area. Structure of products and nano composite elucidation was carried out by 1H NMR, 13C NMR, FT-IR, scanning electron microscopy (SEM). Nanoparticles have an extremely high surface to volume ratio, which dramatically change their properties when compared with their bulk sized equivalents. It also changes the way in which the nanoparticles bond with the bulk material. The result is that the composite can be many times improved with respect to the component parts. Some nanocomposite materials have been shown to be 1000 times tougher than the bulk component materials . 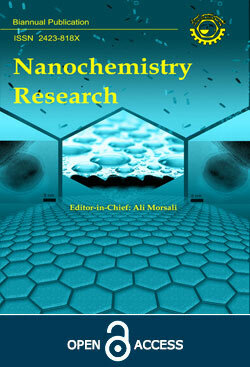 Nanocomposites are currently being used in a number of fields and new applications are being continuously developed. Applications for nano composites include: Thermal stability , Chemical resistance , Optical clarity  and etc. Beside, application nano-composite as nano catalyst in organic synthesis provide unique chemical processes with special attributes such as enhanced reaction rates, eco-friendly condition, higher yields, greater selectivity and ease of manipulation . Fig. 1. SEM image of synthesis SiO2@FeSO4 nanoparticles. Fig. 2. FT-IR spectra of the synthesized SiO2@FeSO4 nano particles (a) and the SiO2 nano particles (b). In organic chemistry oxime is very important functional group as intermediate martial for synthesis protocols, because of this, variety systems used catalyst for converted Nitro groups, alkyl groups, carbonyl groups and etc. to oximes . Carbonyl compounds are a good convenient group for synthesis oximes and many catalysts as nano Fe3O4 , Bi2O3 , Cu-SiO2 , TiO(acac)2  used. In continuing our attempted to apply nanocatalyst for synthesis oximes  for the first time in the world, we decided to synthesis oximes by nano composite as SiO2@FeSO4. We wish to report this nanocatalyst efficiently promotes the conversion of structurally different aldehydes and ketones to the corresponding (Scheme1). All reagents and substrates were purchased from commercial sources with the best quality and used without further puriﬁcation. SiO2@FeSO4 nanocomposite prepared in high purity according to the reported procedures in the literature . Melting points were determined by Philip-Harris is melting point apparatus and are uncorrected. IR spectra were recorded on a Thermo Nicolet Nexus 670 FT-IR spectrophotometer. 1H and 13C NMR spectra were recorded on a 300 MHz Bruker Avance spectrometer in 300.13 and 75.46 MHz, SEM spectra were recorded on Philips XL30, respectively. All yields refer to isolated pure products. TLC using silica gel 60 GF254 aluminum sheet was applied for determination of the purity of substrates and products as well as monitoring the reaction. The nano-composite was prepared by the sol-gel method. Briefly, FeSO4·H2O (0.85 g, 0.5 mmol) was dispersed in the mixture of ethanol (4 mmol), deionized water (4 mmol) and tetraethoxysilane (TEOS) (1 mmol), followed by the addition of 0.056 mmol of H2SO4. This solution was stirred mechanically for 60 min at room temperature. Then the product, SiO2@FeSO4nanocomposite, was separated by filtered, and was washed with deionized water and ethanol three times and dried at 80 °C for 10 h.
A mixture of Substrate (1 mmol) and SiO2@FeSO4 nano-composite (1 mmol) was ground in a mortar. NH2OH•HCl (2 mmol for aldehyde and 3 mmol for ketones) was then added to the mortar, and the grinding of the reaction mixture was continued for a moment. The mixture was stirred magnetically in oil bath (70-80 °C) under solvent-free conditions for reporting them. TLC monitored the progress of the reaction (eluent; n-hexane/EtOAc: 5/3). After completion of the reaction, the mixture was washed with EtOAc (3 × 5 ml). Evaporation of the solvent affords. SiO2@FeSO4 nano-composite dissolved in solution is recovered after the reaction and separated from other products by washing with acetone and water (5 ml: 5 ml). The nano-composite is then dried in an oven at 110 ºC overnight, and re-used up to four times in the same reaction without losing its activity. A mixture of Acetophenone (5 g) and SiO2@FeSO4 nano-composite (2 g) was ground in a mortar. NH2OH•HCl (2.5 g) was then added to the mortar, and the grinding of the reaction mixture was continued for a moment. The mixture was stirred magnetically in oil bath (70- 80 °C) under solvent-free conditions for 10 min. TLC monitored the progress of the reaction (eluent; n-hexane/EtOAc: 5/3). After completion of the reaction, the mixture was washed with EtOAc (3 × 5 ml). Evaporation of the solvent affords the white solid Acetophenone Oxime in 90% yield (1215 g, Table 2: entry 1).white solid, m.p. : 58-60 °C. IR (KBr, νmax): 3235, 3084, 2924, 1496, 1444, 1370, 1300, 1079, 1005, 924, 847, 773, 756, 688 and 651 cm-1. 1H NMR (300 MHz, CDCl3, δ ppm): 8.86 (br s, 1H), 7.69-7.58 (m, 2H), 7.43-7.36 (m, 3H), 2.32 (s, 3H), 13C NMR (75 MHz, CDCl3, δ ppm): 156.1, 136.6, 129.3, 128.6, 126.1, 12.3; MS (EI) m/z (%rel. Intensity) 135 (M+, 86), 118 (14), 106 (22), 103 (26), 94 (32), 77 (100), 66 (16) and 51 (33). The SiO2@FeSO4 nanocomposite was synthesized by sol-gel method, Nano particles with 35 nm average diameter were characterized by SEM image as Fig. 1. Comparing the FT-IR spectra of the synthesized SiO2@FeSO4 nano particles (Fig. 2a) with the SiO2 spectra (Fig. 2b) show the peaks at 1178 Cm-1 for FeSO4. NH2OH•HCl in the absence of nanocomposite. The reaction was sluggish and no corresponding oximes were formed even after many minutes. However, in the presence of 1 molar equivalent SiO2@FeSO4 nano-composite, the reaction progressed smoothly with benzaldehyde at oil bath (70-80°C) to afford excellent yield of the corresponding oxime (Table 1 entry 2). Likewise, we have applied this protocol for the oximation of aliphatic, aromatic, α,β-unsaturated of aldehydes and ketones and the result summarized in Tables 2 and 3. Both activated and deactivated aromatic aldehydes and ketones were converted to corresponding oximes. The tolerances of various functional groups have been examined by reacting the substrates with chloro, methyl, methoxy and Nitro groups, and the reaction conditions are compatible with these functional groups. This protocol also applied to convert α-diketones. The yields of the corresponding oximes of α-diketones (Table 3) are good, although required time for completion of the reaction was longer than other carbonyl compounds. In addition, we applied the report of our method for converting of five grams of some carbonyl compound used in this protocol and the result shown in the Tables 2 and 3. To continue, we compared oximation of aldehydes with ketones at the same condition, as the result shown aldehydes converted faster than ketones, this procedure affords chemoselective convert of aldehydes in the presence of ketones (Scheme 2). As oximation of compounds with two carbonyl groups was carried out selectively on one carbonyl moiety (Scheme 3). In order to show the efficiency of this method, we compared our results with other reported in literature as shown in Table 4. (Z)-oximes and (E)-oximes can be separated on a silica gel TLC plate. Although they are both colorless, ultraviolet light will reveal their positions on a TLC plate. TLC (or thin layer chromatography) is performed on a glass plate which is coated with a thin layer of silica. The small amount of the mixture to be analyzed is loaded near the bottom of this plate. The TLC plate, then placed in a shallow pool of a solvent in a developing chamber so that only bottom of the plate is in the liquid. This liquid slowly rises up the TLC plate by capillary action, when the solvent has reached the top of the plate; the plate is removed from the developing chamber, dried and investigated ultraviolet light. In case of aldoximes, the syn form is the one in which both the hydrogen and the hydroxyl (-OH) group are on the same side of the C=N (1). Whereas in the anti-form, they are on the opposite side (2). Selectivity in oximation of aldehydes with SiO2@FeSO4 nano-composite is a perfect and the corresponding E isomer of aldoximes were obtained in high with excellent yields (Table 1). However, with ketoximes, the geometrical isomers are better differentiated by using E-Z notations. The Z ketoxime has hydroxyl group and the group with higher priority on the same side of C=N (3). However, in the E ketoxime, they are arranged on the opposite sides of the C=N (4). In this paper, we have shown SiO2@FeSO4 Nano composite promoted oximation of various carbonyl compounds by hydroxylamine hydrochloride in oil bath (70-80 °C) under solvent-free conditions. aldoximes and ketoximes were obtained in high yields within 10 to 15 min. This method offers some advantages in term of clean reaction conditions, easy work-up procedure, short reaction time, and suppression of any side product. So we think that NH2OH•HCl/SiO2@FeSO4 Nano composite system could be considered a new and useful addition to the present methodologies in this area. The author thanks and gratefully acknowledges the financial support of this work by the research council of Urmia University and Nano Research Center of Iran. P.M. Ajayan, L.S. Schadler, P.V. Braun, Nanocomposite Science and Technology, Wiley-VCH, Weinheim, Germany, 2003. J. Musil, Surf. Coat. Tech. 207 (2012)50. Y. Jaya, V. Ruban, S.G. Mon, D.V. Roy, Appl. Nanosci. 4 (2014) 233. W.N. Nkeuwa, B. Riedl, V. Landry, Prog. Org. Coat. 77 (2014) 1. A. Maleki, M. Kamalzare, Catal. Commun. 53 (2014) 67. I.A. Mikhaleva, A.B. Zaitsev, B.A. Trofimov, Russ. Chem. Rev. 75 (2006) 797. B. Zeynizadeh, M. Karimkoshteh, J. Nano. Chem. 3 (2013) 57. L. Saikia, J.M. Baruah, A. Thakur, J. Org. Med. Chem. Lett. 1 (2011) 12. K. Ramanjaneyulu, P.S. Rao, T. Rambabu, K. Jayarao, C.B.T. Devi, B.V. Rao, Der. Pharma. Chem. 4 (2012) 473. B. Zeynizadeh, E. Amjadi, Asian J. Chem. 21 (2009) 3611. M. Ralleanu, M. Crian, C. Petrache, D. Crian, A. Jitianu, M. Zaharescu, D. Predoi, V.V. Kuncser, G. Filoti, Rom. J. Phys. 50 (2004) 595.
 a) B.S. Furniss, A.J. Hannaford, P.W.G. Smith, A.R. Tatchell, Vogel’s Textbook of Practical Organic Chemistry, 5th ed., Pearson Education, Dorling Kindersley (India), 2008, b) Alfa-Aesar Research Chemicals, Metals and Materials Catalogue, 2008-2009. Meisenheimer, Lamparter, Ber. 57 (1924) 276. S. Prateeptongkum, I. Jovel, R. Jackstell, N. Vogl, C. Weckbecker, M. Beller, Chem. Commun. 1990 (2009). B.R. Kim, G.H. Sung, J.J. Kim, Y. Jin. Yoon, J. Korean Chem. Soc. 57 (2013) 295. Your use of the Nanochemistry Research website and materials is subject to the Creative Commons CC-BY 4.0 License.